Transport dog crates are a necessity when traveling with your pet. Come check out the many types available. Why Should Dogs Be Crated While Traveling? Many of us love to travel with our pets, but are we all making sure our dogs are as safe as they can be? Riding with a dog loose in the car can lead to distractions that could cause accidents. Even if your dog has the most perfect car manners the world has ever seen, he still at greater risk for injury if someone else runs into you. Sometimes it's also necessary to crate your dog at times once you reach your destination. This is for your dog's well being as much as anyone else's. While you're distracted unpacking, your dog is busy checking out all the interesting new smells. What happens if he wanders off while you're busy? And what if you plan to visit a restaurant? Only guide dogs are allowed inside, so you need to have a safe place to keep your pet when he can't be with you. Transport dog crates fit the bill quite nicely. There are a wide variety of transport crates available, and some are more suitable than others depending on the type of traveling you plan to do. Soft-sided travel crates are certainly convenient. They're lightweight and made of sturdy canvas or nylon mesh. The models are collapsible for quick and easy storage, and easily pop back up when you need them again. Although soft-sided transport crates are useful in many situations, they do not offer the best safety for your pet while riding in cars. They will keep your dog contained, but there's not much protection during an impact. Climate controlled dog crates are the wave of the future. A big step up from standard plastic carriers, these models have a built in temperature modulator that holds the crate at the ideal ambient temperature by either cooling or heating the crate interior as needed. Simply switch the unit on, and it will monitor conditions on its own. This type of travel crate makes traveling in hot or cold weather far more comfortable for your pet, not to mention safer. Many dog enthusiasts who work with working breeds use aluminum box-type crates. These transport crates are certainly sturdy and will make the most excitable sporting dog feel secure. Sizes are typically larger to accommodate even the largest working breeds. 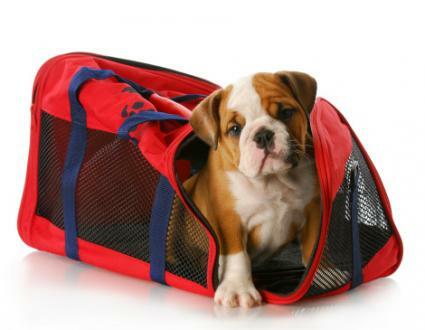 If you plan on traveling with your dog by air, an airline approved travel crate is a must. You dog won't be allowed on the plane without one. Airline crates are made from, high impact plastic, and have steel mesh windows and a door for good ventilation. They are also perfect for everyday car transport. Here are some tips to keep in mind as you search for the right crate. You'll find heavy gauge wire crates on the market, but these aren't your best choice. The crates are uncomfortable for long drives, and your pet stands a greater chance of breaking a leg if his leg goes through the wires during an impact. Make sure the crate offers cross-ventilation. Most crates have ventilated doors, but a good travel crate should have a few ventilated windows to ensure adequate air flow. The crate should have a sturdy shell to provide more stability in the event of an accident, and preferably have a handle to thread your seat belt through to help hold the crate in place. You'll find many types of transport crates at the following web sites. PetsTrends.com: This site offers the K-9 Camper, a soft-sided unit that ranges from $20.00 to $120.00 in price, depending on crate size. They also offer the Komfort Pets climate controlled carrier, only available in size small for $400.00. GunDogsOnline.com: This site offers a line of Vari-Kennel airline crates, as well as insulated and uninsulated covers to fit them. Prices average between $40.00 and $50.00. The site also offers other travel crates. PetJoyOnline.com: This site is a great resource for aluminum box crates. Available in single to multi-units, prices range from $300.00 to $900.00.